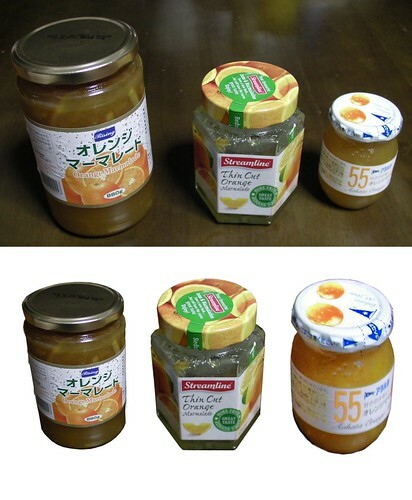 Displayed above are, from the left, 880g of Egyptian orange marmalade at 198 yen, 400g of Danish orange marmalade at and 398 yen, and 45g of Japanese tangerine marmalade 298 yen. The Danish is my favourite since it is low in sugar. I feel sorry for the Egyptian children who, so keen to get their hands on Sony Playstations perhaps, must forgo their marmalade in this quantity. The Japanese marmalade is so expensive because of higher labour and land costs, and because Japanese people trust the quality of products that are made within their shores. But this is getting ridiculous. The price per gram of marmalade is: Egyptian .22 yen, Danish 1 yen, Japanese 6.6 yen. In other words the Japanese marmalade is almost exactly 30 times more expensive than the marmalade imported all the way from Egypt! In addition to the genuine quality of Japanese marmalade, I sense that other factors are a work. First of all the size of the Egyptian Marmalade jar may work against it due to the "mottainai" feeling-of-wastefulness that it is likely to invoke in Japanese consumers. Most Japanese marmalade purchasers would think twice about buying such a large jar due to the fact that they would foresee having to throw much or most of it away when, unable to finish it, it starts to rot. That Japanese feel this sense of waste so keenly is due to their greater 'animistic,' Nacalian identification with the visual world. Secondly, most Japanese, identifying in this way as they do far more with their body image, they are keener to avoid obesity. If on the other hand, you think you are your 'mind' ( self-narrative) then you are more likely, like me, to indulge in a little, or a lot of, marmalade. Thirdly not only are smaller jars, like smaller Japanese bowls and food servings in general, a major reason for the absence of the pudgy marmalade mouth and beef-burger bottom, they are also made possible again by the Japanese tendency to remain in the living, visual present. 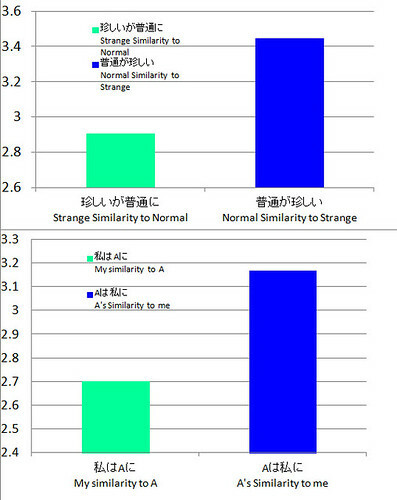 The 'imaginary' (in Lacan's terms, for the Japanese sight is a lot more concrete) contains no scale information. A bonsai tree if cultivated and trimmed well, looks the same as a giant oak, if you get up close. A Zen garden looks like an inland sea (Stein, 1990). An a tiny pot of Japanese marmalade can present the same visual content as a massive Danish or Egyptian jar (see the lower row of images). As long as you stay away from symbolic considerations of size and weight ("880 vs 45 grams!)" you can see the world in a pot of Japanese marmalade. This may explain why the Japanese are fond of moving their rice bowls near to their mouths, or rather their eyes, since up close everything looks bigger. It may also explain part of the sushi-grasp (sushi wo tsumamu) praxis noted by Kitayama (his book, 1995-ish); a sushi in the hand is bigger than a whole fish on the plate. Finally, there is a degree of exclusive mistrust of things that are not Japanese. Some claim that this is because the Japanese are 'deep and profound' racists xenophobes but some foreign companies do attain trust (such as Louis Vuitton) . It is just that trust be earned through (visual) experience, rather than through (linguistic) promises and the acceptance of the threat of (linguistic) litigation. Lacan argued that humans pass through the mirror stage, in which they identify with their image, to the symbolic where they identify with language. Nacalianism turns that on its head, in Japan. Stein, R. A. (1990). The world in miniature: container gardens and dwellings in Far Eastern religious thought. Stanford University Press. More and more the Japanese are teaching each other to be American. They're loving it. Steven Heine's extensive research has shown that the most robust distinction between Americans and Japanese is that the former are full of it - they praise themselves and others way out of proportion to reality. While American's engage in this linguistic ego massage, which in the USA is said to promote health, wealth and well-being, the Japanese have been, traditionally, if anything, linguistically self-critical. 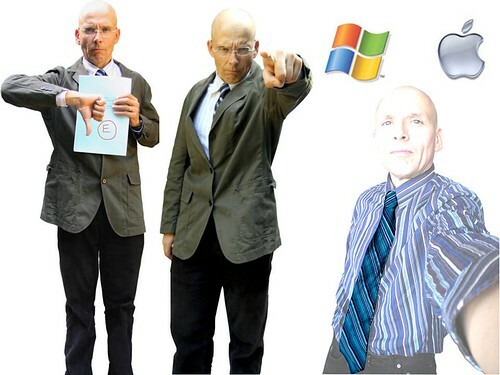 The greatest advantages of being self-critical is that it facilities self-improvement. Japanese reflect upon their own flaws (hansei) and then get ride of them (kaizen). Alas, however, such is the hegemony and attraction of Western culture, (the bs, the auto affective self-narrative) that the Japanese are reading and publishing books instructing mothers to take it easy, get into "co-chingu" and above all indulge in praise, since praise is what decides how happy you are going to be. Praise, praise praise. They are also writing books that trash upon the last bastion of Japanese culture - Japanese industry - since Japanese industry is not nice to young people -- such as for example, Tadashi Yanai (2009) who (rather than "praising") encourages himself and others to forget their successes as soon as they have achieved them. Soon alas they may forget how to be Japanese, and end up as really low-grade Americans, since however much they practice they are never going to catch up with us. I grew up with people who are centuries ahead in their skill at auto-ego-massage. I think that if the Japanese go down that route, they are going to get right royally shafted. While it has its drawbacks, the only Japanese way forward is to hansei and kaizen. The other thing that these JapanAmericans are forgetting is that while their words were always self-critical in the past, the Japanese have traditionally loved what they themselves looked like. They were quite positive enough without all the "self-enhancement". Yanai, T. 正柳井. (2009). 成功は一日で捨て去れ. 新潮社. Purikura, a set on Flickr. 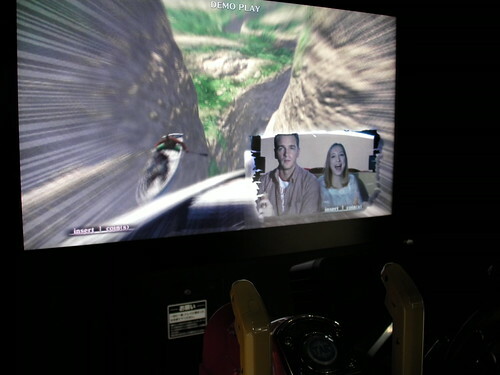 The Japanese have auto-photography booths often in game arcades, enabling friends or couples on a date to take a set of self-portrait photographs as souvenir (see also Kinen shashin, taken on tour). These photo booths now offer lighting, posing and post-processing services to make the user/model to appear more attractive: cute and bi-racial. The lights are strong which helps to remove skin blemishes and wrinkles any traces of which are removed in post. The lens faces down from a low, 1.3 m position forcing users to crouch down and look up. The latter produces the classic Facebook pose, hiding any double chin. Crouching down forces the model to stick their neck and chin out even further, making the model appear even thinner. Next to the lens a pair of models appear on a screen suggesting suitably cute poses for the users to emulate. In post the skin is made smoother pinker and the eyes larger and a little more blue to obtain the desired more-Caucasian, less Asian, bi-racial effect. Since my eyes are already quite large the result tends to be grotesque. Teeth and the whites of ones eyes are made whiter. Engrish is also added to some of the photos automatically, and one can select a variety of background colours and images. Westerners self-enhance linguistically. I believe that the above demonstrates that, in accordance with the Nacalian position of this burogu, Japanese self-enhance (and I don't mean self-improve) in the world of the image. Japanese Men's Pants are Colourful, Feminized, a photo by timtak on Flickr. These Gunze pants are for men and are very colourful. They were advertised with copy a "Beautiful body, Wild heart." You can see the video of beautiful men wearing colourful pants here. Matriarchy that it is, Japan converges upon femininity. While they still like to differentiate themselves here by being more "wild," there are plenty of cosmetics for men, there are even man bras . Some commentators see this feminization of the male form as a recent phenomena (Kuon, 2011) but there is a long tradition of Japanese men dressing in what might be termed feminine clothing. Rearing red underwear recently saw a boom among both men and women, since it was claimed that doing so warmed people up and improves their health and luck (see this online retailer). Japanese men have long been inclined to wear red underwear to battle in pre-modern Japan, and to competitions recently such as when　Kouji Yamamoto, the coach of the Japanese World Baseball Classic team, wore red underwear to the WBC tournament - indeed it is said that all the coaches did so (Takayama, 2013). In Japanese mythology, Japanese heroes and gods have a tendency to cross dress. Amaterasu, the sun goddess dresses as a man, Yamatotakeru, the brave of Japan, dressed as a woman to kill one of his enemies, and Susano'o, the original warrior god, may have dressed as his bride to be (according to one, persuasive reading) to kill the Eight-Forked Serpent, Yamata-no-Orochi. It should also be noted that the Japanese are handed their reflections by the sun goddess - a woman - whose mirror is said to be in all of their minds. That the Japanese do have a mirror in their minds, or heads, has been demonstrated experimentally (Heine et al. 2009). The feminization of the Japanese male clothing also finds expression in the way in which the soul of Yui Ikari remains in the Eva robotic suit that her son Shinji Ikari controls in the popular anime series Neon Genesis Evangelion. Evangelion explains itself by reference to Lacanian theory - "Mother is the first other," which holds that the first intra-pschic other that is an ontic necessity for the creation of self (see Boszormenyi-Nagy & Framo, 2013 p33 for an overview of similar theories), is an internalisation of mirror which is mother. This blog argues, Nacalianly, that for the Japanese, the mother/mirror is the last other, the one that they take into the world and make their mirror, suited, red-pants wearing selves with. I don't mean to suggest that Japanese men are any more feminized than Western men, who have a different type of helper. Kuon, S. 久遠さら. (2011). なぜ今どきの男子は眉を整えるのか. 幻冬舎ルネッサンス. Who needs Guns?, a photo by timtak on Flickr. 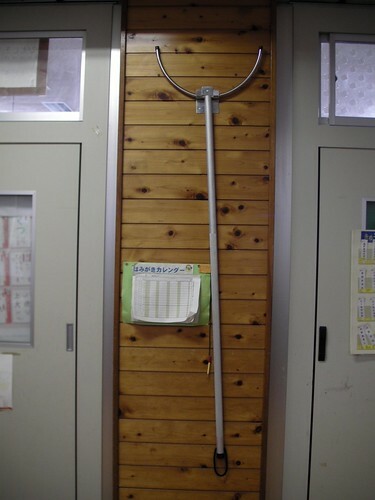 These two pronged forks are attached to the wall of Japanese schools for use in case someone where to come into the school and attempt to kill children. Since Japan is largely gun free, and swords are likewise restricted by law, the most dangerous weapon that Japanese can get their hands upon is usually a knife. A man, with mental illness, did however break into a Japanese classroom and kill several children with a knife. Mamoru Takuma, since executed by hanging, went on the rampage in Ikeda primary school in Osaka, fatally stabbing 8 children and wounding 15 more, reportedly as a way of having himself killed and exacting revenge on a departed girlfriend. So at least since that time, these two pronged forks, called sasumata, are kept in schools to enable the teachers to tackle knife wielders by trapping their torso in the prong. They are especially effective if used by several people from several directions at once, and date back to the Edo Period when likewise guns and swords were illegal among the general population, and the Japanese attempted to apprehend criminals uninjured. These Edo Period sasumata were however equipped with blades or spikes at the U end of the fork to help prevent the criminal from grasping the pole (sasumata). It is surprising that Japan is not only gun-less but fairly blade-less. Daggers, which are defined as two sided blades, are illegal longer than 5.5cm cm. Most murders are carried out using kitchen knives of which there are plenty. But despite the fact that there are no restrictions on the purchase of one sided kitchen knives, and that they can be had for 1 dollar or more, I know of very few law abiding Japanese that carry or possess blades for use a a self defence weapon. Even a 5.5cm knife would be a significant deterrent if someone came at you with a kitchen knife. The long kitchen knife wielder would win, the victim would probably die, but the attacker would be deterred and sufficiently wounded such that they would not be able to attack many more people. I think that if the victims had small self defence blades, then an attacker would be hard pressed to kill three people since after killing two he would have at least two 5cm wounds in his body. So why don't Japanese people carry a small self defence blade? Why aren't their such blades in schools? In line with my usual interpretation of Japan, I suggest that the reason is cultural. There has long been a taboo on blood in Japan. Wounding anyone, especially in such a way as to penetrate their skin and draw blood is an anathema to vast majority of Japanese. There are no guns, few knives, and though many Japanese are karate experts it is even far harder to get yourself beaten up. Why are the Japanese generally so non-violent? There is quite a lot of white collar crime, such as fraud, cartels and other corruption which, though there are a form of violence, are often argued to be forgiveable. I think that the difference lies, as usual, in a difference in what people are thought to be. In the West the body is something that contains the mind. A wound to the body leaves the person intact. In Japan however, as an extension of animism, I believe people identify with their bodies, particularly with their bodily image. Thus to stab someone, to penetrate another's skin, is to penetrate their person. It is a much weightier act, of far greater violence. To deceive another person is however often even a good idea (uso mo houben 嘘も方便) since, contra Westerners, the Japanese do not identify with their self-narrative and words are the mere fluff that allows bodies as people to make jokes to each other. Japanese Video Game, Western Users, a photo by timtak on Flickr. To entice Japanese youth to use this pirate themed Japanese shooting game, a Western couple are shown enjoying its use. Don't Japanese people find this incongurous? Apparently not, and are on the contrary more inclined to identify with caucasians than with a Japanese couple. Other than the influence of caucasian images of beauty, another possible explanation for this use of Westerners is that the Japanese are more animistic, seeing bodies, mannequins and other human effigies, and even things, such as cups of noodles, as animate. 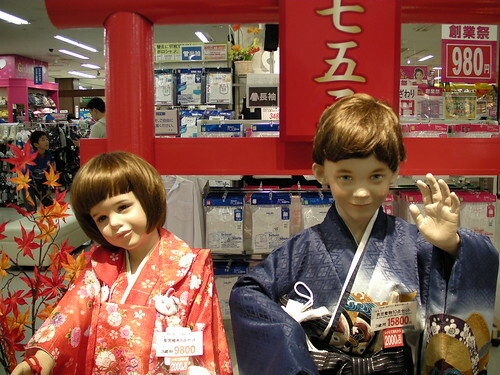 If there were Japanese mannequins in Japanese shops then the shoppers might feel inclined to greet them, or wonder who they are. The use of Western bodily images therefore may depersonalise the image to the extent that, rather than being Taro Suzuki and Hanako Tanaka, it is just a body, with which the Japanese observer can identify and inhabit. A Japanese variation on basketball arcade game. Instead of throwing mini basketballs through a mini basketball hoop, players are invited to throw balls into a the mouth of a Cup Noodle pot that opens and closes with a tantalising, and rather creepy, smirk. "Ball me!" the pot seems to be imploring. Cup noodles are tasty to humans, small orange balls are tasty to Cup Noodles. The message seems to be in Japan the Cup Noodles bite back. Cup Noodles smile. They are alive. Nissin even produced a Cup Noodle robot to celebrate the 40th anniversary of their invention last year. There is also something fundamentally strange or incongruous about pot noodle pots even to the Japanese. In a country where to be is to be visible, there is greater expectation for things to be as they appear. Cup Noodles are however, unlike most Japanese food which is eaten with the eyes, in appearances quite unappetizing: a cylinder of expanded polystyrene, industrial lettering, without even an attempted at any imagery that might stimulate the appetite. They are however fairly tasty, and extremely convenient so they have persisted and are sold in great number, all the while arousing a sense of absurdity in their Japanese consumers.